Back row, from left: PSW District Award recipients Betty Hung, Sean Miura and Craig Ishii (representing Kizuna). 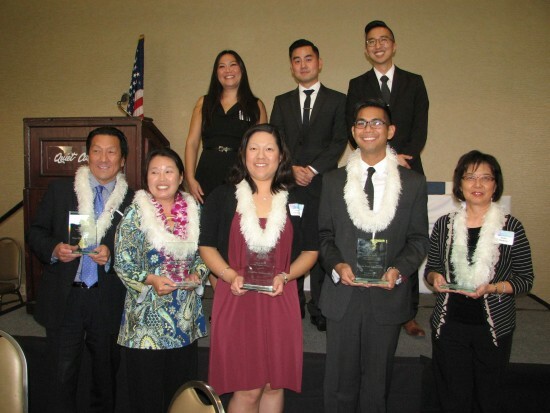 Front row, from left: Chapter honorees George Kita (representing Marilynn Nakata), Alice Ishigame-Tao, Jennifer Okabayashi, Jean-Paul deGuzman, and Seiko Watkins. Opening remarks were made by traci ishigo, PSWD programs coordinator. Michelle Yamashiro, PSWD governor, and Kurt Ikeda, PSWD at-large board member, served as emcees. • Betty Hung, Asian Americans Advancing Justice – LA’s policy director, who oversees the organization’s strategic policy and advocacy initiatives to promote equal access and equal justice for Asian American, Native Hawaiian, and Pacific Islander communities in solidarity with other underserved communities. She started her career at Advancing Justice in 1997 as a member of the legal team that litigated the groundbreaking El Monte Thai and Latino garment worker case and rejoined the organization in February 2012. At Advancing Justice, Hung supports the leadership and civic engagement of Asian American and NHPI community members on issues such as immigrant rights, racial justice, education equity, and criminal justice reform. She was on the legal team that supported the leadership of undocumented immigrant youth who led and won the campaign for Deferred Action for Childhood Arrivals (DACA), and co-founded the Asian American Pacific Islander DACA Collaborative. She serves on the boards of Asian Pacific Environmental Network (APEN), Clergy and Laity United for Economic Justice (CLUE), Economic Roundtable, Long Beach Immigrant Rights Coalition, and the National Lawyers Guild. In her acceptance speech, Hung said, “At this moment where our nation faces a moral crisis, the leadership of the Japanese American community is needed more than ever … Just earlier this week, the House of Representatives voted to effectively bar refugees from Syria and Iraq from coming to the United States. The mayor of Roanoke, Va. called for the suspension of assistance to Syrian refugees and invoked the internment of Japanese Americans during World War II … Donald Trump, who has been leading in the Republican polls, has called for a registry to track Muslims, similar to what Nazi Germany did to Jews. • Sean Miura, a Los Angeles-based artist, writer, and community organizer who produces and curates Tuesday Night Café, a 17-year-old free Asian American art series held twice a month from April to October in Little Tokyo. 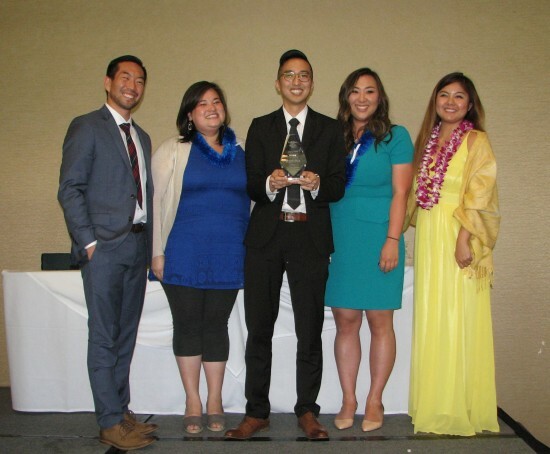 He is a core member of the New Generation Nikkei Fund, a statewide giving circle, and LTRoots, a group created to engage young adults in the Little Tokyo community. He has served on organizing committees for many conferences and events, such as the 2011 Legacy of Japanese American Activism conference and Okaeri – A Nikkei LGBT Gathering. In 2013, Hyphen Magazine named him Mr. Hyphen, recognizing his work as a community organizer. Miura’s poem “Yonsei” was published in the 25th anniversary edition of the Harvard Asian American Policy Review, and his writings on Asian Americans and current events have been featured on various blogs. He also conducts writing workshops for students. Miura plays the shamisen and was a student of Masayo Ishigure of the Sawai Koto Academy’s New York City branch. He performs with the Eco-Band (a project of Great Leap), and performed on three recordings included in the Obon catalog of the Buddhist Churches of America. While an undergraduate at USC, he served as president of the USC Nikkei Association, sat on the USC Asian Pacific Islander Advocacy Council, and performed with and produced music for hip-hop dance team Chaotic 3. Miura thanked everyone for attending, especially his family. “I am the youngest of four brothers, between the doctor and the lawyer … I bet my parents never thought the artist would be the one honored for his organizational skills,” he joked. He stressed, “The work I do is not particularly extraordinary, nor is it necessarily groundbreaking. I am but one person in a long history of people who have served our community … I’m also a fourth-generation community organizer, so in some ways I’m merely continuing the family business. • Kizuna, a not-for-profit 501(c)3 organization with a mission of building a future for the Japanese American community through the development and engagement of the next generation. Now in its fifth year, Kizuna works with over 400 students per year, hosting internship, counselor recruitment, and high school leadership development programs, as well as the largest network of summer camps for the Japanese American community in the Greater Los Angeles region. Kizuna’s primary strategy focuses on the growth and development of students through a continuum of programs known as “the Kizuna Pipeline,” which starts in elementary/middle school, building a foundation of cultural identity and heritage through regional summer camp programs. As students move into high school, Kizuna builds on this foundation by facilitating community service, encouraging philanthropy and offering opportunities for community engagement. By college, Kizuna offers professional internship positions and opportunities for young adults to serve as counselors for Kizuna’s youth programs. As adults, the pipeline is completed as Kizuna facilitates the transition of adults to positions on nonprofit boards. The organization has produced a critical mass of emerging leaders for the community. As Kizuna looks toward its next phase, the goal is to create an overall community awareness of cultural values as well as the necessity of giving back. Another takeaway is that “we are an organization that works with the next generation, but we’re also governed by the next generation,” Ishii said, explaining that getting young people involved means giving them trust and support. “The things that they do may be terrible, and that’s the risk that we have to be okay with. We’ve had some terrible programs and some terrible workshops and some downright failures, but again it’s our comfort with that level of discomfort that has allowed us to empower the next generation. Stacy Toyota, Kizuna board chair, and Kristin Fukushima, Kizuna co-founder, were invited to join Ishii on the stage. From left: Co-emcee Kurt Ikeda; Kizuna representatives Kristin Fukushima, Craig Ishii and Stacy Toyota; co-emcee Michelle Yamashiro. • Seiko Watkins, who has been one of JACL Arizona Chapter’s most active members for the past 40 years, serving on the Board of Directors, Scholarship Committee and Teacher’s Workshop Committee. She co-founded and co-chaired the chapter’s Ladies Activity Day, which has brought 30 to 40 women to the JACL Hall each month for the past 10 years to learn how to make Japanese crafts and prepare Japanese foods. It has become one of the most popular chapter activities. She has also been instrumental in coordinating clean-up days at the JACL Hall. She has co-chaired the annual picnic and the Centerpiece Committee for the chapter’s 75th anniversary luncheon. During the 2006 National JACL Convention in Chandler, Ariz., she co-chaired the Registration Committee and helped out with everything from goodie bags for attendees to centerpieces at the luncheons and Sayonara Banquet. Watkins served on the Japanese Friendship Garden Fundraiser Committee when plans were first made to create the garden in central Phoenix. She is a licensed food server who each month serves 70 to 90 seniors attending the Japanese Senior Center. She has been an active volunteer at the Arizona Matsuri for the past 20 years. She is a Thousand Club member and her daughter, Jill Yano, is also a Thousand Club member and current co-president and membership chair of JACL San Francisco Chapter. 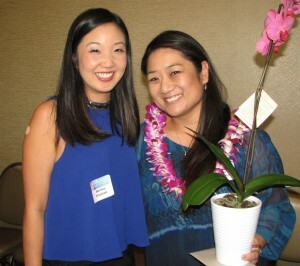 Luncheon Planning Committee members Marissa Kitazawa and Alayne Yonemoto (chair). • Jean-Paul deGuzman of San Fernando Valley JACL. He was raised in the San Fernando Valley and holds a BA from CSU Northridge in Asian American studies and an MA in Asian American studies and a Ph.D. in American history from UCLA. As an undergraduate, he participated in a service learning course about the hidden history of the valley’s Japanese American community. This led to his involvement with the SFVJACL, and motivated his research on the multiethnic history of community-building and racial politics in the valley in the 20th century. He has been involved with efforts to establish a historical-cultural monument at the site of the Tuna Canyon Detention Station, where Japanese, German and Italian immigrants were held during World War II. He earned UCLA’s highest teaching award in 2013 and has also taught at UC Santa Barbara, where he was a postdoctoral scholar at the UC Center for New Racial Studies. He currently teaches at CSU Long Beach. • Jennifer Okabayashi of Riverside JACL. She attended UC Riverside, where she graduated with a BA in business administration and sociology. Frank Hiroyasu, former president of the UCR Nikkei Student Union (NSU) introduced her to Riverside JACL by inviting her to a chapter board meeting. In 2009, she was installed as the youth representative, a position she has held since then. Okabayashi attended the National JACL Youth Conference in St. Paul, Minn., which shaped her decision to stay involved in the organization. She has attended events at national, district, and chapter levels and has served as a Riverside JACL delegate at the JACL National Conventions in Chicago, Los Angeles, Bellevue, and Washington, D.C. She also represents the chapter at PSW District quarterly meetings. In 2013, she joined the PSW District Annual Awards Luncheon Committee. Currently, she assists Riverside JACL with its chapter ad in the Holiday Issue of The Pacific Citizen, writes articles for the chapter newsletter, and assists with annual events, including the Installation Luncheon, Family Picnic, High School Scholarship Awards Dinner, and General Membership Meeting. She is looking forward to being a lifetime JACLer. • Marilynn Takako Nakata of Downtown Los Angeles JACL. Born in Hawaii, she attended Hawaii Baptist Academy and International Christian University, and graduated from University of Hawaii at Manoa with a BA in Japanese language and sociology. She worked as a tour coordinator in Waikiki and studied business. Her mother had always talked about her family’s internment experience. They ran the Kirita Store in Kohala, which went under after Nakata’s grandfather, Kamekichi Kirita, was interned immediately after Pearl Harbor because of his work with the Japanese Consulate on behalf of the Japanese immigrant community. Later, his wife and children were interned on the Mainland in the Jerome, Ark. camp. In 1979, Nakata moved to California. In October of that year, she began her career at Union Bank, then known as California First Bank, in the Downtown Los Angeles office as a note clerk. She was promoted to the Loan Department and worked at various offices (Crenshaw, Panorama City, South Gardena, Gardena) utilizing her language skills to serve the Japanese-speaking community. Nakata was an assistant vice president when she left the bank after more than 24 years. Nakata joined the Downtown Los Angeles JACL when the chapter began to be revitalized under a new president, Patrick Ogawa, who asked her serve on the board in the early 1980s. She was active with the chapter for over 25 years in various capacities, preferring to work behind the scenes. She worked with the committees for the Women of the Year luncheons, Pioneer Luncheon, Dodger games for the seniors at Little Tokyo Towers, Christmas Cheer, and 9th Street School Scholarships. She joined Evergreen Baptist Church and was a part of Hula Halau ‘O Kamuela Elua under the direction of Kunewa Mook in Burbank for over 15 years. In 2008, she moved to Hilo and worked as an office manager at the Waiakea Lagoon View Apartments. She helps to take care of her mother, Marian, who moved to Hilo two years ago. Nakata was unable to attend the luncheon and was represented by chapter member George Kita. • Alice Ishigame-Tao, a Sansei and an active member of SELANOCO (Southeast Los Angeles/North Orange County) JACL. Her passion for civil rights was ignited when she was a student at UCLA. One of the earliest movements that she was involved in was the fight for tenure for Asian American studies professor Don Nakanishi. During her time at UCLA, she learned about the redress movement. After graduating, Ishigame-Tao pursued an advanced degree in psychology. During her master’s program she accepted an internship at Little Tokyo Service Center. Upon completing the internship, she was offered a position working with the homeless, low-income and disenfranchised Japanese American population. Under the tutelage of Bill Watanabe and Yasuko Sakamoto, she honed her skills as a community organizer and resource developer. Ishigame-Tao moved to Irvine after getting married and brought along her passion for civil rights. During her time at LTSC, she became involved with SELANOCO JACL and the board of PSW JACL, where she served as board member at large and recording secretary. She was also board member at large, recording secretary, treasurer, vice president and president of SELANOCO JACL. Kenneth Inouye and many Nisei members of SELANOCO introduced Ishigame-Tao to key movers in Orange County like Mary Anne Foo and Michael Matsuda. With support, she was able to open a Japanese-speaking LTSC outpost at the Orange County Asian and Pacific Islander Community Alliance (OCAPICA) office in Garden Grove. She continued to operate the office until she left LTSC in 2002 to raise her son. In 2010, Ishigame-Tao revived a SELANOCO program, Chibi no Gakko, a Japanese American summer camp for children that was started by chapter board member B.J. Watanabe. Ishigame-Tao ran the camp until 2014, when her son aged out of the program. She coordinated a smooth transition from Chibi no Gakko to Nikkei Discovery Camp, which is run through Kizuna. In addition, she is involved with her son’s school and Boy Scout troop, all while working part-time for Irvine Unified School District.